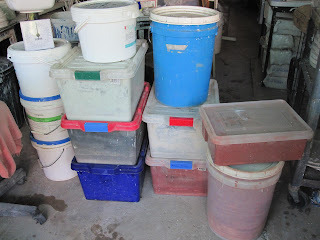 MUDHEART POTTERY BLOG: Glaze making to pass the time??? Glaze making to pass the time??? Had a busy day yesterday but I'm glad I managed to get all these buckets of glaze replenished while a bisque was happlily firing away. I hate, hate making glazes but once I start I quite get into the swing of it but wearing a mask makes it a hot job. I even decided I would make a couple of new ones up. I have never had a chun or good celadon so here's hoping they will turn out - testing in the next firing. I rarely sieve my glazes - don't think I'd make so many up if I had to face that the next day. 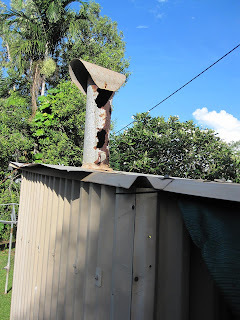 Here's proof my little shed needs replacing, its barely holding together and the chimney has really suffered in the past couple of months. We had light rain on and off and luckily I only had to divert water once away from the damper and that was in the earlier stages of the firing. I am glad the wet season is all but over as I wouldn't attempt firing with the leaking chimney. 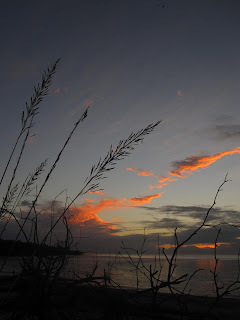 After such a long day the dog and I decided we would take a walk on the beach. I haven't been down to the actual beach in ages and have missed the sand and salt air. Midnight couldn't believe we were actually going down the hill to his favourite place and kept running doing his doggie checkout thing. 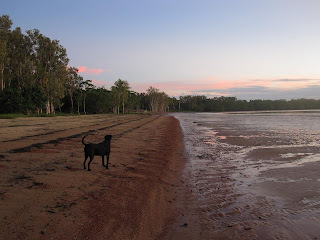 A lone jabiru was out on the edge of the sandbar 'fishing' - that majestic loner seems to typify the peacefulness and solitude of the beach at dusk. 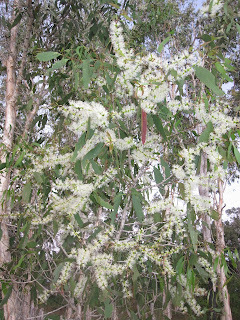 The paperbark are all in flower and the smell is sickly sweet but such an attraction to flying fox - we had a noisy night in the backyard with the continual squabbling over the blossums and tonight I can hear our night visitors back again. A little someone was happy in this big sandpit planting his sticks and exploring with plenty of chatter about this new place. We were all out here so I could film my shedbuilder (No. 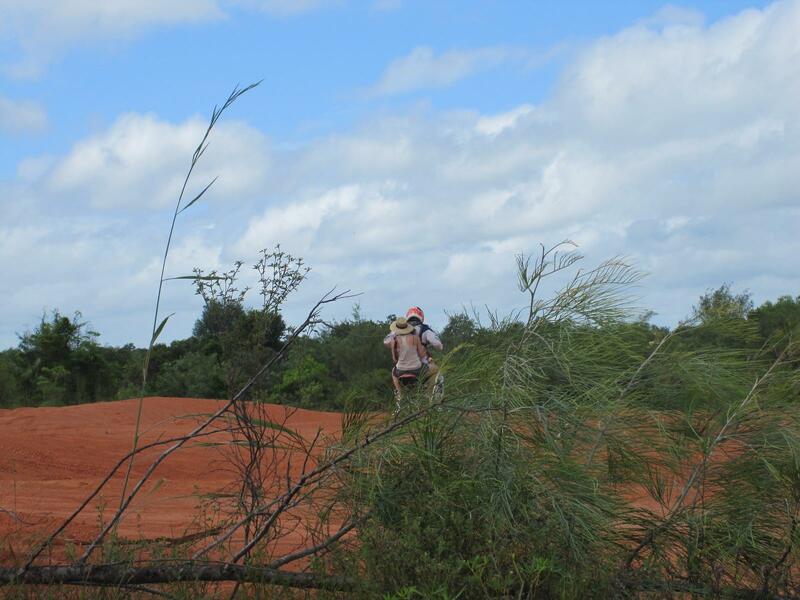 2 son) practicing for the Finke Desert Race (the shed building has to wait until the wet and this event is over). I am definitely not a bike person but here I am perched on the back holding his huge camera being ferried slowly to a good vantage point. The little person in the pit crew loved all the noise and greeted our return to the car with clapping and a wide grin. Unloading tomorrow so the week will be busy glazing and reloading but I have my one annoying burner to take off and clean - another job I try and avoid but I couldn't get it to light even at high pressure so it will have to be cleaned properly. This is what happens when months lapse between firings so it pays to keep the kiln functioning. 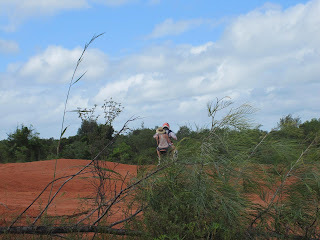 I have a few pieces in a rich red clay and two pieces in the local porcelain so I hope they survived the bisque along with the most important pieces - the dinosaurs!!! How well do we care for our environment?? ?